Oh my. This Skinny Spinach & Artichoke Chicken turns your favorite indulgent dip into a low carb, Weight Watchers-friendly, calorie conscious main course without sacrificing any of the rich, creamy, cheesy taste you love. 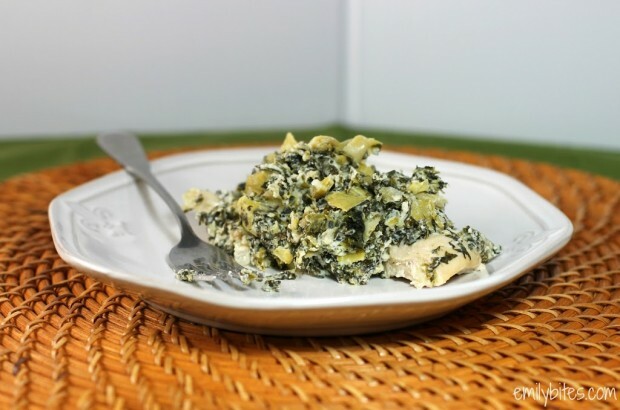 The cream cheese makes the top layer thick and decadent and the briny artichokes and earthy spinach add great texture and flavor. The chicken cooks up perfectly and makes enough to serve to guests or to your family. On top of tasting positively sinful for only 232 calories and 3 Weight Watchers SmartPoints, this dish is extremely easy to prepare and requires very little prep time. This may just be your new go-to weeknight meal! See, they can fit if you make them! Preheat oven to 375 degrees. Lightly mist a 9 x 13 baking dish with cooking spray. 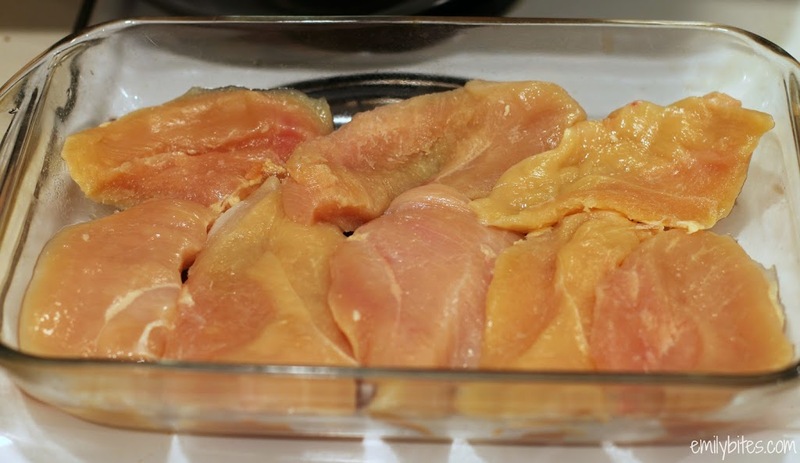 Lay the chicken breast cutlets across the bottom of the dish in a single layer (see photo above). Sprinkle them with salt and black pepper and place them in the oven to bake for 15 minutes. While the chicken bakes, combine the yogurt and softened cream cheese in a large bowl and mix together until thoroughly combined. Add all the remaining ingredients and stir together until everything is well mixed. Remove the chicken from the oven after the 15 minutes (it will not be fully cooked yet). If the chicken has released a lot of excess liquid at this point then drain it out or soak it up with paper towels and discard. Using a large spoon or a spatula, spread the cream cheese mixture evenly over the chicken in a nice thick layer. Place the dish back into the oven and continue to bake for another 20-25 minutes until the chicken is cooked through. Delicious idea! Yummy chicken. Ever tried to prepare white asparagus? Made it tonight. Excellent!! Easy and good! And, enough for dinner tomorrow night! (served it to company tonight!!) Thanks for another winner, Emily. This looks delcious. I am going to Morph it into a cupcake/muffin since I do not entertain. Perhaps used precooked rotisseri chicken and blend into the rest of the ingredients. I am a diehard Emily cupcake/muffin fan. The cupcakes/muffins fit so well into my lunch container. Congrats on the Oprah list of healthy foods. Would you mind sharing your muffin adaptation if you’ve done it already? thanks!! Can fresh spinach replace the frozen in this recipe? If so, would you recommend sauteing it first? How much fresh spinach? 10 oz bag?? There is nothing better than spinach and artichokes together! Excellent – we will have this again. This was wonderful; made it last night! Single girl now has dinner for the week! Thanks! I like easy one dish meals like this! I made this tonight…OMG, it was delicious! Thanks for a great recipe! I cannot wait to make this! I am the only one who will eat it in my house.. oh well more for me! Does it reheat well? Considering making a half batch and just reheating it on my Zumba nights when I already eat seperately from my family. 🙂 I just love your recipes. They never sacrifice flavor. I would say I make 3-4 of your things a week. I just made the lemon and blueberry muffins for the first time. Holy smokes! Delish! Does this freeze well.. I am planning on halving the recipe anyways, but it would make it a TON easier if I could use part for dinner and then lunch and then freeze the other two portions for another week… THANKS! Where would I find parmesan cheese in a can? Mandy, I mean the pre-grated kind in the green plastic can that you get at the supermarket (as opposed to grating your own off a block). It’s probably what you already have on hand. We use and love your cupcake recipes with won ton wrappers and LOVE them. Thanks so much. Made this tonight for dinner and ohhhhhhhmygoodness is right. This is awesome!! Thank you so much for all your wonderful recipes. Fan for life!! I made this for dinner tonight and thought it was really good. Kind of like spinach and artichoke dip baked on chicken. Hubby loved it too! DELISH! My husband and I loved this. It will become a regular dinner for us. Made this last Monday. My husband loved it! I thought the topping was great, but the chicken underneath was kind of lackluster. Not sure what I can do to make this more to my liking. I panfried it with some Tony Chachere’s seasoning and a little low-sodium chicken broth…makes a big difference…just brown it half way, though, so it won’t be dry…and easy on the Tony’s so it won’t be too salty.Hope this helps. Emily, Thank you so much! This recipe was so easy to make! We loved the spinach dip topping so much that I’m gonna make it just as a dip for Superbowl Sunday! Keep up the great recipes! very nice and healthy recipe to cook at home. My husband was a little disappointed because it was not as “creamy” as the dip. I nicely told him to be quiet and eat. Guess what… he ended up LOVING it! Makes for great left overs! I seriously can’t stop sharing this recipe with people! I LOVED it. 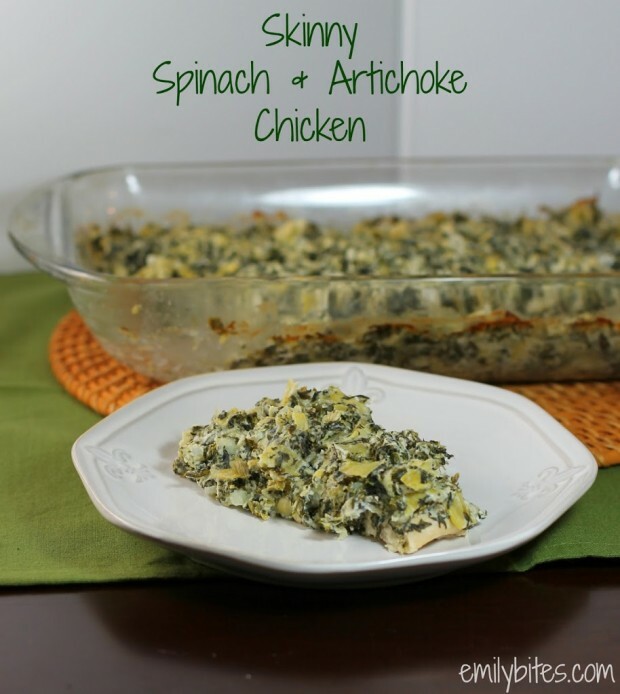 The flavors are everything I love about spinach artichoke dip and it’s nice and filling for only 6 points! Thank you SO much – this will be a regular in my rotation! I made this for dinner last week – it was soooo good! I used fresh spinach (sauteed it with a little olive oil and some minced garlic & onion)but otherwise followed the recipe exactly. Thanks for an amazing recipe Emily, I just found your blog and plan to make almost everything on here! I made this last night for dinner…AMAZING! It is only me, my husband and our 16 month old (she LOVED it), so I only made 4 chicken breasts but kept the topping the same amount so I would have it leftover. Today I ate it with baked tortilla chips. Yum, yum, YUM! Love your blog. It is GREAT to have fun but healthy meals to cook for my family. DELISH!!! Another one of your recipes to add to the meal rotation. Pretty easy and very filling. I felt like I didn’t even need a side with this meal as it was protein, veggies, and dairy all in one! You’re a genius!!! Keep ’em coming! Made this tonight. OMG so yummy! Thanks Emily for another winner!! This was absolutely amazing! My second recipe of yours and my husband and son couldn’t be happier! The was amazing my husband and son loved it, will def keep on making it! Looks delish and this is totally on my list for the coming week! Is it safe to assume that frozen artichoke hearts would work just as well as canned? Stupid question…if I half the recipe, is the cooking time the same? Made it last night and added some jalapenos to mine – oh la la! It was great and I can’t wait for lunch for my leftovers. This was AMAZING!!!!!!!! Leftovers were fantastic and I’ve been told by my boyfriend that this meal needs to be in steady rotation! It was easy and so delicious and so PP+ friendly!! THANK YOU!!! I have everything but the artichokes! LOL 🙂 Do you think it would still taste ok without them? Another great recipe. I made this today. It’s hard to believe it’s weight watchers but I can tell when I step on the scale. Your site has made losing weight so much easier with your great tasting and filling recipes.Thank you. Made this tonight. My kids were SO excited because they love Spinach Artichoke Dip. It was so good, and everyone loved it. This is absolutely delicious! I make it as a dip and use carrots for dipping. Great, healthy snack. Thanks for another terrific recipe! I tell people about your recipes and site every chance I get. Keep it up!! Just made this to eat for this week. I was going to save it but it smelled too delicious when I took it out of the oven,so I took a spoonful (I cut the chicken into smaller pieces). It is great! Made this lastnight and it was awesome! The husband loved it! We had a lot of leftovers so tonight I cooked some wheat thin spaghetti pasta & tossed it in a little light butter and mixed in chopped up the leftover chicken for a pasta dish. Delish! I was wondering if anyone has a good idea of a side dish to go with this delicious chicken? I’m a little late to try the recipe but I loved it!! The only thing I did was add a little extra garlic and used season salt on the chicken. I’m really excited to be eating this all week! This looks so yummy – I can’t wait to make it! Thanks for sharing! I never leave comments on recipes, but this recipe was SO GOOD. Thank you so much for sharing it. It is going to be added to my rotation immediately. The only change I made was using fresh spinach instead of frozen. If you are on the fence about trying this, just do it!